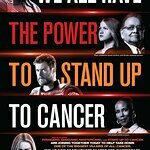 Giada De Laurentiis, Stand Up To Cancer (SU2C), & the Melanoma Research Alliance (MRA) share the importance of melanoma prevention and detection. After tragically losing her brother Dino to the deadliest of all skin cancers, the award-winning chef was inspired to take a stand. Join Giada at SU2C.org and Facebook. It's Impossible To Beat Cancer. Alone.